As a microblading student at Art of Beauty Academy, you get a lot of great material to work with. Besides receiving theoretical and practical instructions and one-on-one demonstrations, each student gets a chance to practice microblading on skin simulations and live models. Be it a live or online microblading training, the course you choose has to prepare you for the learning process, practice period, certification, and finally your first treatments with real clients. All of this would never be possible if you didn’t have quality microblading tools necessary to finish the course. That’s why every student of Art of Beauty Academy’s microblading trainings receives a Premium PhiBrows Kit for free. The kit has over 50 individual products and equipment which will serve you well after you finish your training and start microblading as a certified artist for the first time. So, what’s included in your free PhiBrows premium microblading kit? Before we unpack it and see what’s inside, here are answers to some of the questions you might have about your kit you will find extremely useful. 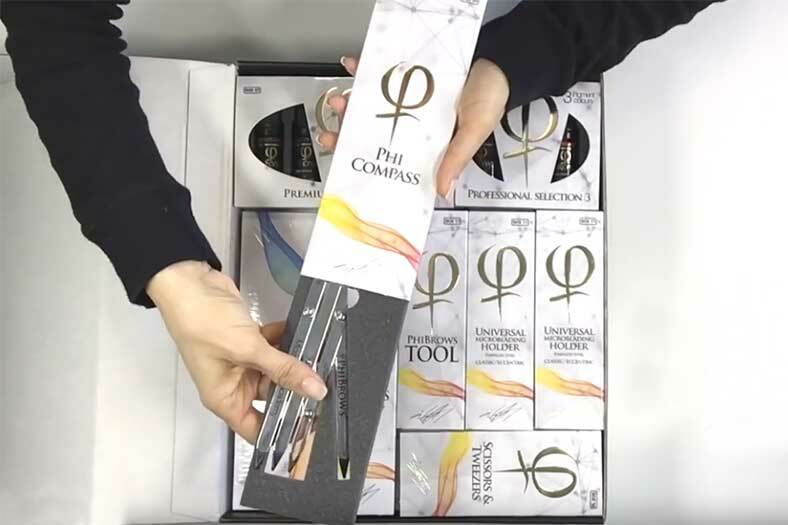 What Makes a PhiBrows Premium Kit the Best Microblading Kit? The PhiBrows Premium Kit is a starter kit. However, it has the quality to serve certified artists and masters as much as beginners. This comes down to equipment, which has been handpicked to form the ultimate base when starting your microblading journey. 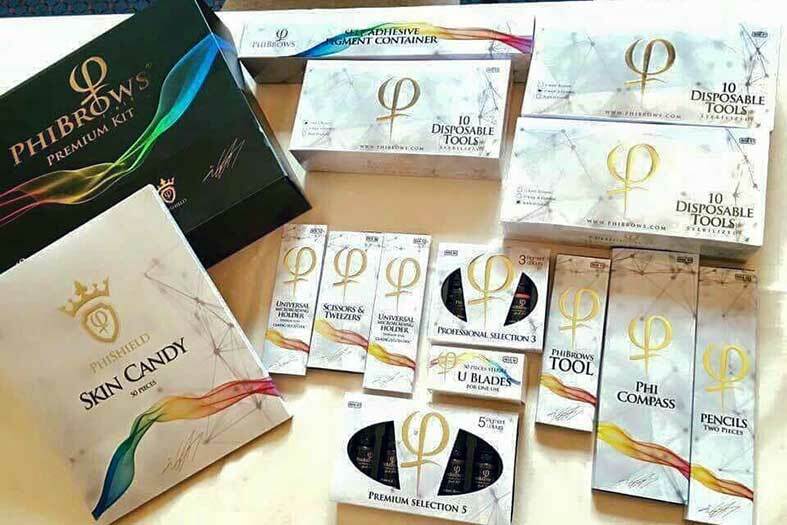 The kit contains over 20 original PhiBrows items. All of them have been tried and tested by master artists at the PhiAcademy. This includes basic tools for manual microblading as well as products for the microblading procedure, preparation and aftercare. You also receive spares, so you will continue using them well after you finish your training. Of course, you can always resupply at the microblading online supply store. Plus the entire kit is completely free! How and When Do You Receive a Microblading Kit? All students of a PhiBrows microblading training receive a free premium kit. 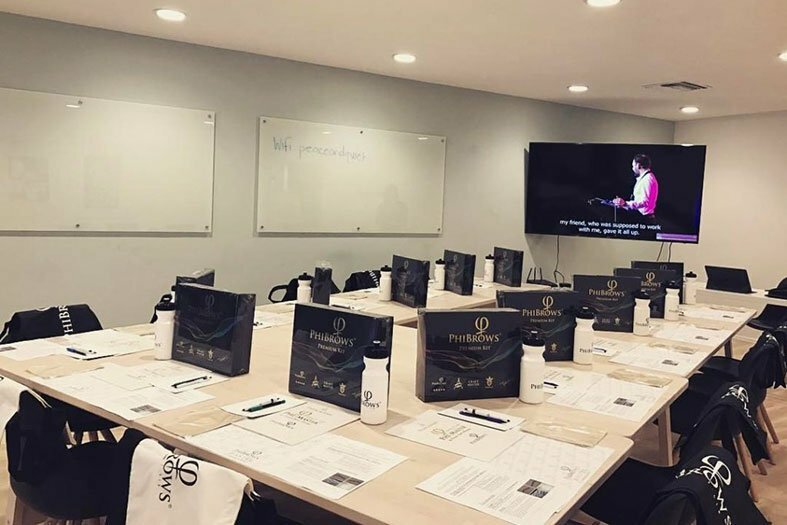 In case you choose to attend a live PhiBrows microblading training, you will receive your kit once the training begins. Usually, it’s the first thing you do after you complete filling out the registration forms. 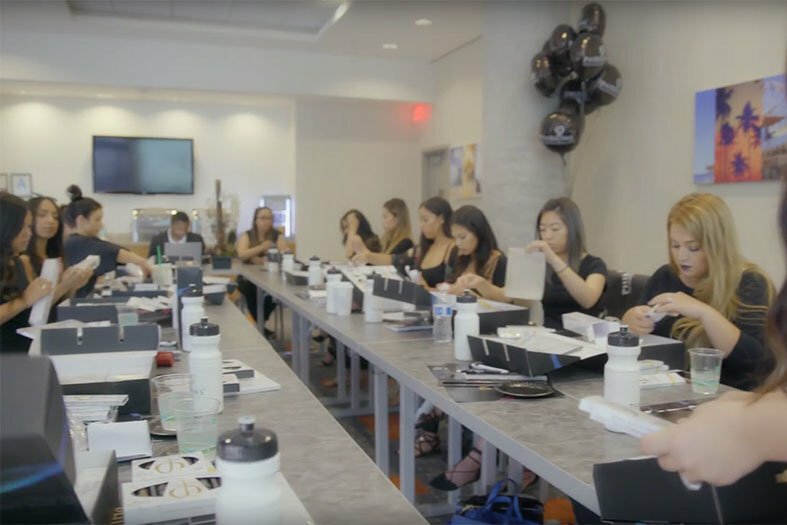 After taking your place, the instructor will tell you to open the kit and explain how each tool or product is used, as well as its microblading application. On the other hand, if you choose the online PhiBrows microblading training course your kit will be delivered straight to your door via mail. The shipment usually doesn’t take more than a week from the moment you completed the payment. In both cases, the kits are the same. So, if students change their mind and want to attend a live course instead, they are allowed to do so. All you have to do is pay the difference in course’s price and bring the kit you already received by mail with you on the chosen live class. Where Can You Buy a Microblading Kit? A microblading kit is only intended for students of Art of Beauty Academy’s microblading trainings. It can’t be bought on its own. The only way to receive it is by attending our live or online training, which ensures that anyone who uses the kit is educated to use it properly. This is important when it comes to client’s safety, but also the reputation of future microblading artists. How Much Is a Microblading Kit? As mentioned earlier, the microblading kit can only be purchased as part of a microblading training. When the price of all products included in the kit is combined, the total price of the kit is $1200. This price is included in the full price of any training you purchase, live or online. However, the kit has the potential of making a return on investment by using it after the course. It can pay off the PhiBrows training cost what makes the kit so worthy. How Long Does a Microblading Kit Last? Every Premium PhiBrows Microblading Kit has enough supplies to last long after you finish your training. That means you will continue using the same tools and materials you did during your course once you complete the Craft Master certification course, and as a certified artist start charging clients for your microblading services. Although we can’t make a rough estimate of how long timewise the kit will last, it can easily last you up to 90 treatments. So, depending on how quickly you can pass the microblading training and certification course, you will be able to repay the kit, the training and still earn a handsome profit. What Does the Free Premium Kit Include? Here’s an overview of all the products you will find inside the kit. Let’s take a look! Brown 1 is the lightest of all brown colors. It is applied on brows of clients who have light brown or natural blonde hair. The pigment is very stable and can last up to one year without the need to be retouched. Brown 2 is a color with the widest microblading application that is primarily used on natural brunettes. Apart from that, it can also treat natural blondes and even clients with darker hair. One bottle of this pigment can treat up to 40 clients. Brown 3 is the darkest color with real application in microblading. It is used to treat brows of dark brunettes and black-haired clients. The pigment is created using the original PhiBrows SUP formula. Golden Brown is a yellowish, light pigment used almost always on clients with very light blonde hair, grey hair or on a bleached blondes. The original formula is very stable and thick for greater durability. Arabian Night is the name given to the black microblading pigment. In microblading color theory, this color is one of three base colors used to create different shades which can be applied onto eyebrows. Warm Effect is a red pigment. It is primarily used to create other colors, like Brown 2. The red color is achieved by mixing red iron oxide and synthetic black and yellow pigments. Still, it’s safe to use and doesn’t contain any traces of heavy metals. This is a protective cream used for care after the microblading procedure. It contains healthy materials, such as minerals and vitamins, which aid in skin regeneration. It’s an essential part of the post-treatment. Before microblading, this pencil is used to mark the shape of the eyebrow according to measurements. The pencil can easily be sharpened and is a standard piece of kit used by established masters and artists. This is a trademark PhiBrows original tool. Its primary use is for measuring the eyebrow and determining its shape according to other facial features. This achieves absolute symmetry regardless of the type of face a client may have. A classic holder is a universal tool which can hold virtually any blade. It’s a multi-use tool, however, it requires sterilization after every treatment. The holder comes in three colors and can last you over a thousand treatments. This is your main tool. An easy-to-maintain piece of gear used for manual microblading. The tool can hold a single blade at multiple angles and is perfect for beginners who are yet to develop their own technique. This is an important set to have when preparing eyebrows for the microblading treatment. The scissors and tweezers are also used after microblading to groom and clean off the eyebrow to achieve the best possible look. For microblading students, this is an important piece of kit they need to practice what they learn. Skin simulations come in different shapes and sizes but are all made from latex. This mimics real skin in the best possible way and prepares students for live model practice. There is no microblading without microblading blades. Each premium kit contains 90 blades which are individually packed, sterilized and ready to use as soon as you open up the package. These are the basic tools and products you can expect to find inside your free premium kit. But there are over 30 other products you will find inside a conveniently packed microblading pack. To find out what else is included in the kit, we suggest you to reserve your spot at one of our next microblading trainings across the US. That way you will learn everything there is to know about each tool and product, yet more importantly, how to use them and become a real microblading artist. Microblading and Trendsetting: Brow Technique Celebrities Are Crazy About!